Yesterday I wandered into truly enchanted country: a land of fairies - of crouched skeletal burials and ancient animal hideaways: the environs of the mysterious 'reef knoll' of Elbolton, towering over the quaint old hamlet of Thorpe. To get there I parked in Hebden - and took the path alongside Hebden Beck down to the River Wharfe. Attractive bridges in sylvan settings present themselves everywhere. The stunning River Wharfe is first met at the elegant suspension bridge - allowing access to a bridle track up towards the hidden hamlet of Thorpe. From the bridle track - I had fine views back over towards the bridge - the fields decorated with ancient lynchets: terracing by medieval farmers for easier ploughing. This was my first glimpse of the famous reef knolls: Kail Hill, at centre - with the head of Elbolton just visible on the right. These are the remains of a massive 'barrier reef' and once lay where shallow waters of a tropical sea met the deeper water beyond. Deeper water?? All you can see now is the massive rampart of Rylstone Fell - composed of darker gritstone ... and the reason? Well when sea levels dropped, almost to marsh-like conditions - great rivers washed in huge banks of sand and gravel to form those high fells. They also covered the reef knolls which have since been exposed again by glacial action. Hope that makes sense! Kail Hill is a superb example of a reef knoll and its limestone is made up almost entirely of fossilised remains of the reef of which it was once a part. More about those later. Behind it can be seen the great 'wave' of gritstone making up the northern ramparts of Rylstone Fell - the contrasting grass colour giving away its acidic nature. Another great view of the contrasting rock types: limestone in the foreground with rich grassland, and the great ridge of Rylstone Fell behind. Quaint old sign pointing the way to the ultimate destination. Thorpe Manor: one of several grand old houses in the village. In the centre of Thorpe is the ancient village green - where a maypole stood for generations. It is a site of special archaeological interest in its own right. Thorpe's unique hidden position - between the reef knolls of Kail Hill and Elbolton, has given it the old name 'Thorpe in the Hollow'. As many authors have stated, it never seems to change: with old barns and bricked up windows looking like they haven't seen humans for several generations. Everything comes from another age: a better time in many ways. A sleepy, carefree time. This unique little cottage seems to personify 'Thorpe in the Hollow'. The feline version: fairies and mysterious happenings are common around Thorpe. This moggy had real personality and seemed to look me up and down like he owned the place. The bovine version: all four legged animals here have a presence about them. The great sacred hill of Elbolton is revealed as we head up an ancient trackway out of Thorpe. Two centuries ago a man met a band of fairies on the hillside here - and when approaching them he was rudely kicked and spat upon. Hiding one in his pocket to convince his daughter of their existence - he was startled to find an empty pocket on returning home. The hill has been the scene of many strange happenings ever since. Even climbing it - you can feel someone watching your every move - even though the sense of isolation is also very real. The rustic lane along the base of Elbolton - with the steep slopes of reef limestone towering up on the right. Thorpe nestles snugly in the hollow between the two reef knolls as we scale Elbolton's eastern slope. It is a battle against gravity - and clearly the ancient folk who dragged their dead up to the cave near the summit must have had serious intention in mind when burying them at such an elevated spot. Just look at that view over Kail Hill! Elbolton Cave itself - properly called Navvy Noodle Hole - lies hidden beneath a limestone scar near the summit of the hill. Not many visit - even fewer go inside - as this cave is tricky to enter. The supernatural activity around the entrance is legendary. The cave - better described as a pothole - has a metal cover to keep out sheep. This is easily lifted to give the same view that Neolithic people will have had some 4000 years ago. A close-up of Elbolton Cave. A 20 foot vertical drop leads into the chamber. Preparing to descend. A very tricky climb down even with a rope - as the sides are slippery and awkward. Presumably weathering has reduced the footholds of the ancients - unless there was another way in which has since been blocked. This is where it all happened in 1888. The Reverend E. Jones of Embsay lowered himself into the cave for a full investigation. Twenty feet down he hit a layer of debris but could hardly have expected what lay in store for him. Here he initially found three human skeletons in a sitting position - knees drawn up to their chins and for all the world appearing as though sitting around a crude fire. These days the finds are considered to be, in a sense, Europe's oldest 'mummies'. The skeletons were actually surrounded by a rough stone wall - and there was evidence that dogs or wolves had been deliberately released into the cave to remove the flesh before being removed by their supervisors! Even so - the history of living things here dates back 300 million years. Examining the reef limestone outside the entrance we meet crinoids from the great barrier that once lay at the margins of a shallow, tropical sea. Some of the fossils - like this gastropod - are stunning indeed. All manner of creatures can be made out with a careful inspection. The structure of the reef limestone is much different than the traditional Great Scar Limestone we are used to in the Yorkshire Dales. The rock is much more brittle and looser in structure. There are other pots on the summit of Elbolton - and one of them links through to the main cave itself. There is also evidence of early mining. Stebden is another reef knoll - just to the north. Strange how the distant Pendle Hill is associated with so many of these ancient sites in the southern dales. The cairn on the summit of Elbolton - looking north to Grassington with Great Whernside and Buckden Pike in the distance. Close-up of Stebden - a beautifully conical reef knoll - from the summit of Elbolton. The great gritstone ridge of Rylstone Fell can be seen behind - consisting of much younger rocks formed by rivers washing in sand and gravel. Wheatears have been at home here for centuries no doubt. Their calls - like clashing pebbles - resemble those of the stonechat. Solitary barn in a rustic setting as we head towards the village of Linton. Linton is an attractive village - with the old clapper bridge spanning Linton Beck, a tributary of the Wharfe. I later rejoined the Wharfe at the lovely Linton Falls, just below Grassington. It hasn't rained much this year - so the rocks were more exposed than usual. The limestone here has a pinkish glow. As far as beauty goes, Linton Falls are difficult to beat. The last stage of my journey through history was a delightful stroll back towards Hebden, along the banks of a sedate River Wharfe. From every angle, this crystal clear river is just stunning on the eye. Avenues of chestnuts line the banks, casting their shadows over the water - where trout and crayfish thrive. Finally - it was back to the stepping stones by the suspension bridge - to put the finishing touches to a great afternoon. A splendid walk. As you know quite a few spots in the Dales are quire spooky. When we moved into Austwick an old chap advised planting a Rowan. which may still be there though we, regrettably, are not. This was an absolutely wonderful stroll--- I am gob-smacked !!!! Want to visit ! With many thanks --- from Jeanie in Ontario, Canada !!!!! Just one of hundreds of walks round here. It's good to have the geology described. It could have been improved by adding local history correctly, eg the bridge at Linton was built by Dame Elizabeth Redmayne. The local farmers refused to contribute so she added the parapets so a laden pony couldn't use it! The clapper bridge is downstream before the road bridge. The famous author and historian, Arthur Raistrick lived in a cottage close to the bridge and Halliwell Sutcliffe, Dales author lived at White Abbey across the main road. Richard Fountaine who left money to build the hospital was a London timber merchant in the 17th century and he made his fortune supplying wood for the rebuilding after the Great Fire of London and also from all the coffins needed after several epidemics of plague. Matthew Hewitt, who was a rector of Linton Church and endowed Threshfield Grammar School lived in a house near the bridge, which is a former Youth Hostel and still called the Rectory. I could go on and on and it shows how knowing about the history of these Dales villages can enhance these walks. Too often we see walkers (all Goretex and with maps round their necks) marching through these villages and missing all the fun! another thing ..... if they all - each of the hundreds - stopped to have a look ......................... it would do your head in! 'A Dales Lover..' is right to mention Halliwell Sutcliffe, who describes the hamlet in such romantic terms in chapter 11 of 'The Striding Dales' "Of all the hamlets nestling in the Dale's secret places Thorpe is the most hidden and most winsome. Peace broods at her heart". I did not know that he lived there, nor, indeed, that Arthur Raistrick did either - this makes it a place of pilgrimage too. Oh, and 'The Striding Dales'should be on each Dales lovers bookshelf. Great blog! Just been up Elbolton - your write-up helped me appreciate it even more! 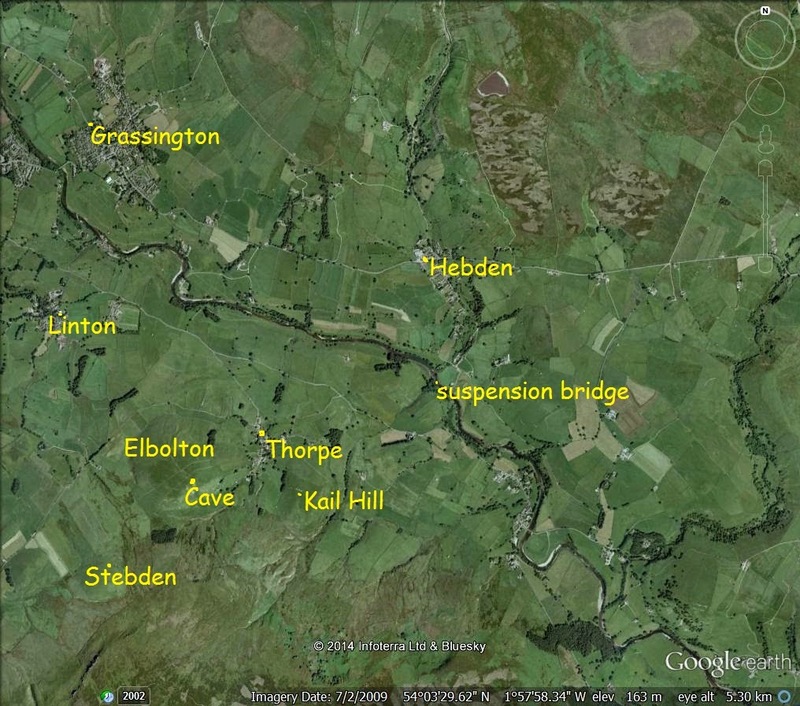 Very interesting - especially about the finds in Ebolton Cave which I visited yesterday. Thanks! [Not sure if I understand all the geology!]. Extremely interesting,have done this walk before but not been up to the cave . Going to do it again today! Didn't see any fairies lol but watched a couple of buzzards circling! Beautiful walk! !